Hunting season is fast approaching in the Jackman region. Moose season also promises to be good as there have been so many sitings this summer….even during the day. Mike saw a beautiful Bull up on Bald Mountain Monday. Can-t wait to see his picture! Deer season starts October 28th! Visit [url=http://www.maine.gov/ifw/hunttrap/2006huntseasonchart.htm] Maine.gov[/url] for specific dates and limits. 😛 Lots of good eats for the hunters in Jackman. You will not go hungry! Johns BBQ on October 7th, Boyscouts Hunters Breakfast early November and the Jackman Chamber of Commerce Hunters Supper the 3rd week of November. Plus all of our great restaurants, pubs and diners for breakfast, lunch, or dinner. visit Cozy Cove Cabin-s [url=http://cozycovecabins.com/jackman/maine-outdoor-fall.php] Jackman Maine Fall Outdoor and Hunting Guide[/url]. WOW!!!!! What a storm last night. 😛 It was like our own 4th Of July Light show….. And as usual in Jackman, today the day after a storm, the sun is out and beautiful again! This is Alumni weekend in Jackman so we hope the weather stays perfect for them. “”Great time. Went 4-wheeling. Saw hawks, deer, moose, rabbits, snakesÃƒÂ¢Ã¢â€šÂ¬Ã‚Â¦. BIGWOOD STEAKHOUSE (BYOB) great but very big dinners. This past weekend, we had a small family group stay with us in 3 seperate cabins. Even though the sun only came out about 40 minutes each day, they had a great time. What I want to share with you is what the young 8 year old wrote in the Journal in the Eagle- s Nest (where she stayed with her parents and bro) My first thought when I read it was Who needs a website! Anyhow it is her exact words, a few spelling corrections only and I hope you enjoy it as much as I did. “”It would be cool if you put out a Warf. It would give you something to swim out to. Everything else is really nice. I am starting to get settled in already. I like the top bunks. I am going to sleep on one. By the way, my name is S.T. (she gave her name) and I am eight years old. I am here with my mom and dad, my brother, my aunt, and my uncle Keith and Lora and Lora-s friend and her dog. A fish stole a worm. I found two and a quarter worms. This place is actually better than I thought. It actually has working toilets, a working sink, ship shape stuff, a TV, it has boats, fans, windows with curtains, towels, good beds, a lamp in the wall bedside the bed, a porch and a coat rack. It actually is cozy in Cozy Cove Cabins. It-s a good place to hide my stash of candy food and drinks. It-s cool. The whole cabin is made of wood. Even the roof. (I think she meant ceiling). 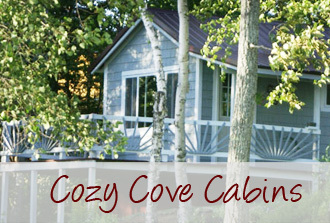 If you wanted to relax, you should come to Cozy Cove Cabins. I like the color of the wood. Cozy Cove Cabins is terrific. It is better than we thought. I like the fact that the water is clear. We caught 3 June bugs. The June bugs were huge. They tickle when you close them in your hand. For some reason, bugs are attracted to lights. That-s why they come inside. Good thing I brought my own pencils. Did you make some of the cabins yourself? I am going to play horseshoe with the boys against the girls today. I think it will be fun. You give us a lot of things to do. Good thing I am a tomboy. My dad brought the 4 wheeler. Maybe he can take me for a ride on it. Make that 4 June bugs. We had a great time! Thank you for letting us stay. Hope we can come again soon. Bye. Thanks for the restaurant tips. BYE! And then she left a drawing of her hand for us! Come join us in Jackman for an Old fashioned 4th of July. Music, games, cotton candy, popcorn and a baking contest followed by fireworks at dusk. Bring your lawn chairs and picnic and have a good ole time. Festivities will be at the Park next to the Town Hall. They saw moose and eagles and even a bear cub laying in the middle of a trail that “”ran so fast to get out of our way….very comical to watch his legs move like that. The kids loved it! CONGRATULATIONS 😀 😀 😀 2006 Maine Moose Permit Lottery Winners! ➡ Prior to the moose season, sight in your rifle. ➡ Moose often appear closer than they are, because of their large size. Keep this in consideration when estimating the distance to the moose before you shoot. ➡ Be prepared to get your moose out of the woods. Rope, come-alongs, pulleys, a chain saw, and waders can be indispensable on your hunt. ➡ Quartering your moose will make it easier to haul and will reduce the risk of your meat spoiling. ➡ Skinning your moose, or filling the chest cavity with ice, will also reduce the risk of your meat spoiling. ➡ A 30-30 can be used for shooting a moose, but it doesn-t have the range of larger guns. A larger caliber gun (308, 30-06, 7 or 8mm) may improve your success and reduce the possibility of wounding a moose. What a great way to spend Father-s Day weekend with the kids! Join us for the YELLOW PERCH FISHING DERBY on Big Wood and Attean Ponds. Participants fish for yellow perch and other “”junk”” fish with cash prizes being awarded for the most chubs and sucker caught! Registration begins at 8:00 am Saturday June 17th at the Chamber Booth. Children under 12 are FREE! ❓ Please call (207)668-4171 for more information or when you make your reservation with us for a weekend of FUN , we will try to answer any questions you may have. This event is sponsored by the Jackman Region Chamber of Commerce. [quote]The only sounds in this wilderness are a gentle breeze flowing through the branches, murmuring waterfalls slipping through the ice covered steam, and gentle chic-a-dee-dee-dee notes coming from my new feathered forest creatures. I can hear my heartbeat and breathing as I lift each snowshoe above the deep soft snow toward my wilderness destiny. Experiencing new territory for the first time is breathtaking. The abundant fresh animal tracks in the snow compare to the abundant human tracks on the snow covered city sidewalks. Approaching Mud Pond, I spot a red fox struggling through the deep soft snow. The blue sky lost it battle against snow clouds, as it begins to snow. The gentle breeze gains strength, as I cross Mud Pond. Following my tracks beside Wood Stream, the forest shields me from icy chill of the wind, and gentle flakes of snow float to the ground, simulating the gentle fall of goose feathers. It is late afternoon. Getting closer to the mouth of Wood Stream at Wood Pond, I hear a strange noise. Picking up my pace, I hurry to see what may be causing it. Arriving at Wood Pond, I become aware of what is happening. My heart races. I hope you enjoy them as much as I have!